Live Esport events are really moving ahead and forging their own identity now. It seems that they are increasing in popularity throughout the world and real world events are quickly becoming something that people enjoy. 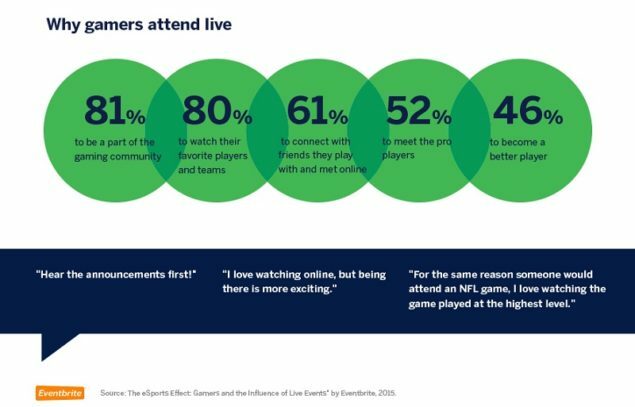 A survey reveals that live eSport events are quickly becoming popular for the atmosphere and for the community they provide. 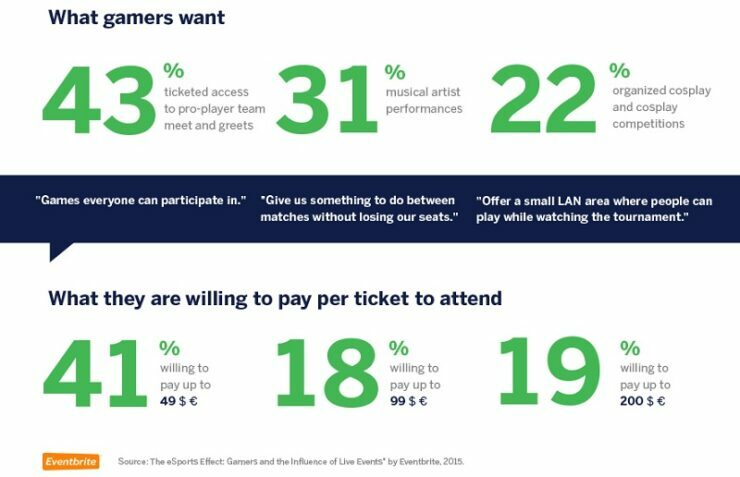 Eventrite, a ticketing marketplace, was able to conduct a survey of the ticket buyers on its site. They were able to determine that an overwhelming 81% of respondents wanted to simply be a part of the community, whereas 46% wanted to attend to improve their own skills at that game. It’s a fascinating study, even if it’s limited in its scope and the number of participants. 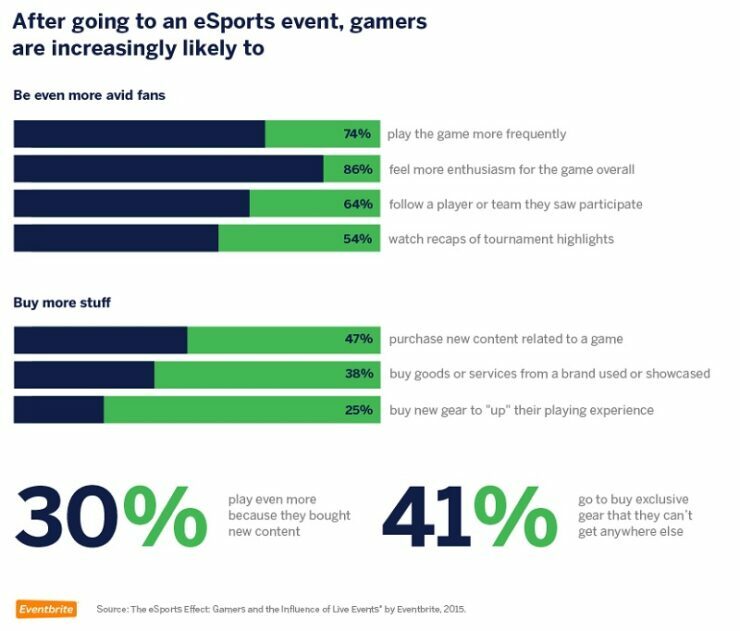 Despite what you may personally think about the growth and rising popularity of esports since their inception, the domain appears to be gaining traction amongst the fan base. You may think negatively about even calling gaming a “sport” or any sort, or referring to and treating such events in similar fashion to other sports. But the facts speak for themselves in this case. One could say that esports are a natural progression from the lan parties of yesteryear. That it’s an evolution of the small and medium sized gatherings of like-minded individuals for the purposes of gaming and enjoying the company of those with similar interests. Now, though, sports complexes are have even been built specifically to cater to gamers and the burgeoning esports empire. The natural maturity into a larger atmosphere seems to be expected. I myself have been to several larger hosted LAN parties in my day, with many hundreds of people there willing to compete on an unofficial level just for the love of the game. It was an incredible atmosphere to be able to find people that enjoyed what I did and actually be able to connect with them. That may not necessarily be the case anymore, but the stereotype does still remain. It’s incredibly refreshing to be able to connect with like-minded individuals. 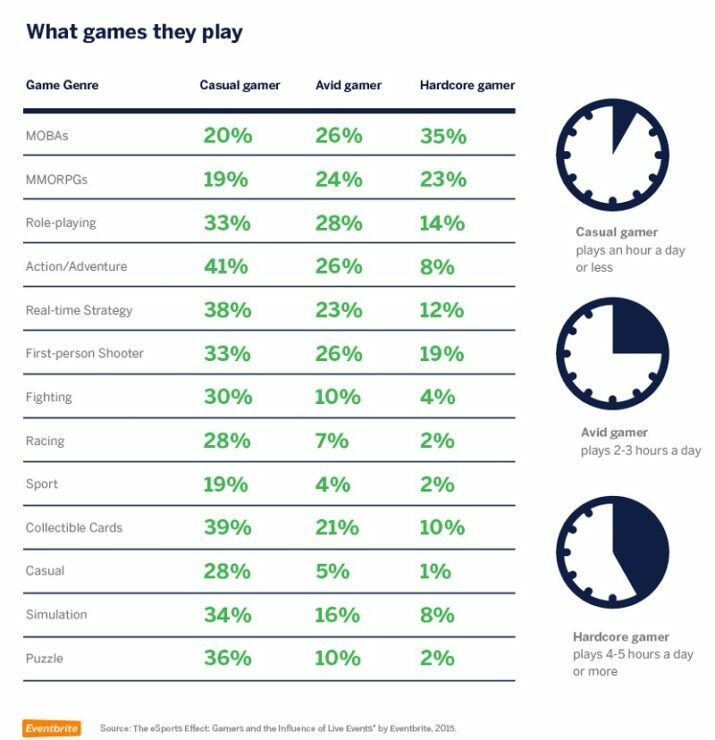 With the expansion of gaming’s role in society, we can see a more inviting atmosphere that accepts gaming as is. This is a great thing, and we finally have our own venues in which to attend that can bring people from all around the world. This can have the potential to open up opportunities for people where they were previously not there. It’s an amazing thing, regardless of personal feelings or animosity towards the eSports world. Being more accepted for the things you love is a plus, no matter if you agree with other parts of the eSports world, such as the games actually part of the competition or even the competitions themselves. This is a winning situation.